Amidst the beats of nagara, bhortaal and khol, Assam Chief Minister Sarbananda Sonowal inaugurated the Ambubachi Mela 2018 on Thursday at Sonaram Higher Secondary School playground, Bharalumukh in Guwahati. Speaking at the inaugural function, Chief Minister Sonowal said that Ambubachi Mela reflected India’s spiritual, cultural and social values. 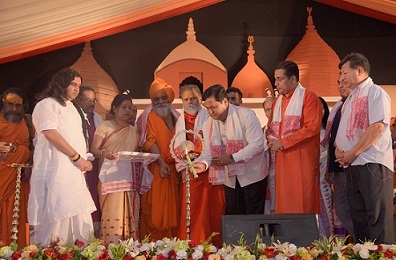 “Indian traditions have their universal appeal and they contributed in nurturing the human values over the ages,” Sonowal said with a call to the people of the State to put joint efforts to make Ambubachi Mela as one of the most attractive religious congregations of the world. Stating that the Assamese people are known for their hospitality, the CM also urged the stakeholders to ensure hassle-free visit to the Kamakhya Temple by the pilgrims during the Ambubachi Mela. Underscoring Prime Minister Narendra Modi’s call to the youth to work with honesty and perseverance to build a strong and vibrant nation, Sonowal further exhorted them to imbibe spiritual and moral values and bolster India’s march towards excellence. Speaking on the occasion, Assam Tourism Development Corporation (ATDC) chairman Jayanta Malla Baruah announced to build a ropeway from Bharalumukh to Kamakhya Temple. Assam Finance Minister Himanta Biswa Sarma, Education Minister Siddhartha Bhattacharya along with leaders from Rashtriya Swayamsevak Sangh (RSS) were also present in the programme. Besides, Director General of Police Kuladhar Saikia, Kamrup (M) Deputy Commissioner Virendra Mittal and Commissioner of Police, Guwahati, Hiren Chandra Nath also attended the inaugural programme. A large number of priests from different parts of the country and communities of Assam along with satradhikars of different satras were also present in the programme. CM Sonowal also released an information booklet for the pilgrims on the occasion.